Staff Selection Commission has finally declared the much awaited Result of Tier 1 of SSC CGL 2016 on 08 November late in evening on official website ssc.nic.in. About 15 lac candidates were waiting for the result. Tier 2 Exam will be conducted on 30 November 2016. Apart from the result announcement date, the commission also declared a tentative schedule for SSC CGL TIER II Exam 2016 i.e., the TIER II examination is scheduled to be conducted from 30 November 2016 to 02 December 2016 (tentatively). The candidates are desperately waiting for result to declare as the same will pave way to them in preparing for TIER II Exam. The overall selection procedure for SSC CGL 2016 includes Written Examination, Data Entry Skill Test/Computer Proficiency Test and Document Verification. The SSC CGL TIER I Exam 2016 was held from 27 August 2016 to 11 September 2016 to fill up 4874 (tentative) posts in Staff Selection Commission. In total 15 lac candidates appeared in the examination who are now waiting for the result to get declared. Keeping in view the notice issued by SSC on 14 October 2016, the result is supposedly to be declared by today i.e., 08 November 2016. The extended result declaration date had given goose bumps to 15 lac aspiring candidates whose heart beats were sinking awaiting the SSC CGL TIER I Result. However, the wait is over now and candidates can check their result at ssc.nic.in. Staff Selection Commission, Combined Graduate Level Exam TIER I Result (SSC CGL TIER I Result) will be declared at ssc.nic.in by evening. Candidates are supposed to be ready with their registration number/ roll number and date of birth (as on admit card) to check their result. 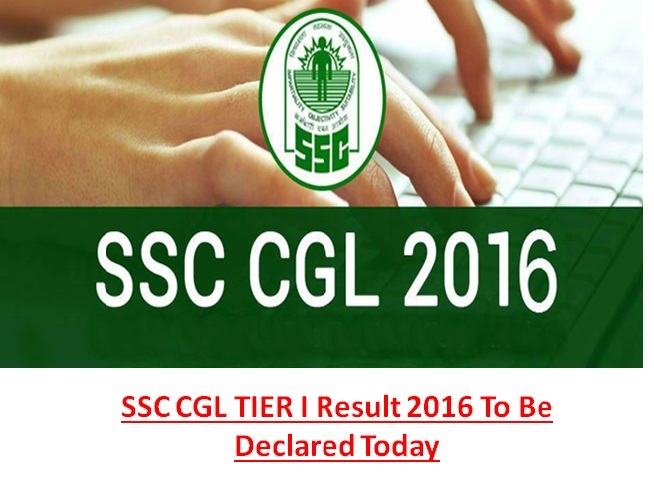 The SSC CGL TIER Exam Result for 2016 has just few more hours to be announced. However; the aspiring candidates can calm themselves and tally the paper via response sheet which was released by the commission on 21 September 2016. Staff Selection Commission conducts Combined Graduate Level exam every year to recruit candidates against vacancies in various administrative posts under government of India. The entire exam is conducted in four tiers. According to the responses of the aspiring candidates the cut off for SSC CGL TIER I Exam would be somewhere between 112-122 marks. The response sheet was issued by SSC and on the basis of which candidates were able to tally their answers. SSC CGL Tier 1 exam was held from 27 August 2016 to 11 September which was computer based. However for the candidates of Srinagar the exam was held on 25 September. 38.04 lakh candidates had registered for the exam. Near about 15 lakh candidates had appeared for the exam and are awaiting the SSC CGL Tier 1 result. The examination was held in 44 batches at 96 centres across the country. Aspiring candidates can keep their fingers crossed till today for SSC CGL TIER I Result 2016 to declare and hope for the best result. The result will be available at ssc.nic.in and applicants can view the same by using their registration id/ roll number and date of birth. The overall merit list would be prepared when the candidates will qualify all four levels of selection procedure for SSC CGL 2016. The complete recruitment procedure of SSC CGL 2016 will be over by end of April 2017 i.e., in a record time of eight months when the TIER I examination was scheduled.